Welcome to the 2019 Fresno County Fruit Trail! Whether you’re a first-time visitor or returning “customer,” we welcome you to experience the bounty produced by Fresno County family farmers and enjoy your visit to our rural communities. We will provide updates on the website and Twitter @GoFruitTrail throughout the season, but also recommend that you contact your favorite stand before you plan your trip to make sure you hit the perfect time to buy that special fruit variety you’re looking for. We look forward to your visit to California’s heartland! Our family farmers, Chambers of Commerce, businesses and the County of Fresno welcome you to enjoy your time on the Fresno County Fruit Trail. The Fresno County Fruit Trail is a self-guided tour through California's agriculture heartland was created through a partnership between the elected and civic leaders and the farmers in Eastern Fresno County. The Fruit Trail celebrates the beauty, flavor and culture of this region. We invite you to enjoy orchards full of ripe fruit literally bursting with flavor, Nature's best, California Grown, from the leading agricultural county in the world. Visit our Fruit Trail Members and local Farmers Markets and find the freshest of fruit and other delectable produce. What makes our produce so special is the quality of what is grown and the pride our farmers take in selling their products directly to the consumer. 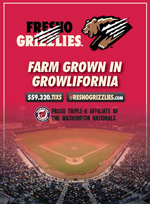 Fresno County would also like to invite you to our hometown festivals and events offering unique experiences steeped in our agriculture traditions. Museums and attractions will both entertain and educate. Enjoy the beautiful scenery, old-fashion charm, friendly customer service, and the finest products you've ever tasted. 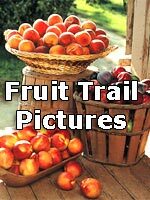 Fruit Trail organizers include Fresno County and the Cities and Chambers of Commerce of Clovis, Fowler, Kingsburg, Orange Cove, Reedley, Sanger, and Selma. This Fresno County Fruit Trail guide map was made possible with the support of the Fruit Trail members and the following sponsors: Fresno County Office of Tourism, City of Clovis, City of Fowler, City of Kingsburg, City of Orange Cove, City of Reedley, City of Sanger, City of Selma, UC Cooperative Extension – Fresno, Fresno Grizzlies, The California Strawberry Commission and the Fresno/Clovis Convention & Visitors Bureau. For more information please contact the Fresno County Fruit Trail at (559) 600-4271. Check out this promotional video featuring Wawona Peach Tree, one of our Fruit Trail partners!